Outreach for the Stars members Ms. Amy Matlack, Ms. Jill DeMaio, Julia Quick, Ms. Michele Dooley, and student show off the clothing items that were donated to the Trenton Rescue Mission clothing drive. 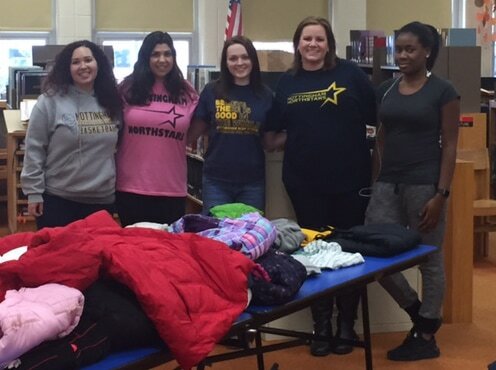 Outreach for the Stars is a community outreach program at Nottingham High School, where student members engage in activities to help Nottingham families in need. The program has grown in both membership and activities over the past six years, allowing it to help many families in need. The students and staff held a "Thrift Shop" the first week of December, where staff and students were invited to "shop" from the donated food, coats, shoes, and winter accessories before, during, and after school. The remaining clothing and food items were then donated to the Trenton Rescue Mission. Furthermore, a group of students donated their time and assistance to the Langtree Elementary School Holiday Shop. Our students are always willing to help out and assist our community schools when needed. Next, a Hamilton resident and student at Robinson Elementary School, Paige Stines, was diagnosed with stage 3 Non-Hodgkin's Lymphoma and has been receiving treatment at CHOP. Due to the financial burden on her family, Outreach for the Stars took a collection and raised $450 for her and her family before the holidays. The annual volleyball tournament is one of the biggest fundraisers and events at Nottingham. Each year, the tournament is held in the two gyms at Nottingham. Students and staff from Nottingham and the Hamilton police sign up to compete against one another in a tournament. Each year, the tournament takes on the maximum amount of teams, 24, and students and staff get decked out in their customized team uniforms. All money raised from the tournament goes to the Outreach program for families should an unfortunate incident happen to them. Outreach for the Stars is expanding into a wonderful program that will continue to do its mission and that is to make families who are struggling find relief with the program’s help. Our program’s motto is “Believe there is good in the world...Be the good."